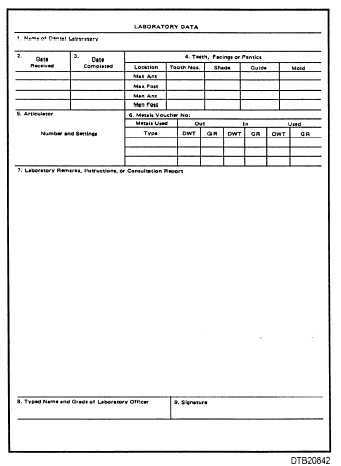 Whenever dental laboratory work is required to support prosthodontic treatment, a DD Form 2322, Dental Laboratory Work Authorization (figs. 8-42), must be completed. This triplicate form has several purposes. It contains patient information and fabrication instructions, and is used as a precious metals voucher and an entry from for composite laboratory value (CLV) codes. 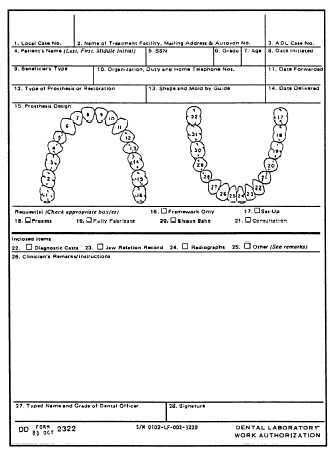 The responsibility for initiating the patient data for this form is usually delegated to the dental assistant. In doing so, you must take care to fill out the form completely and accurately. The dentist will fill in blocks 15-28. It advises the laboratory, in writing, exactly what materials to use and the services to be provided. An incomplete or inaccurate form may result in the lact of necessary items required to fabricate the prosthesis. Most steps in tooth preparation for crowns and FPDs are similar. The number of appointments to complete the fixed prosthesis will vary depending on what is being fabricated. A single metal crown can be delivered in 2 to 3 appointments; whereas, a porcelain fused to metal crown or bridge usually requires 3 to 4 appointments. A basic prosthodontic tray setup is illustrated in figure 8-43. You should become throughly familiar with each instrument and understand its use. The basic steps involved at this appointment involve selecting a shade (if porcelain is used), preparing the tooth or teeth, making the final impression, and preparing and cementing the temporary restoration. Figure 8-42. - Dental Laboratory Work Authorization, DD Form 2322 (Front and back).